If the signal from your antenna is less than perfect or you need a brand new Digital antenna installed – our technicians can certainly help. With many years of industry experience under their belts they will suggest a TV aerial that suits your needs and provides the best possible reception in your area. We guarantee neat and professional installations and outstanding customer service. Choosing the right antenna system is the first step to ensuring a perfect TV viewing experience in your home. Nowadays the majority of Sydney TV stations transmit a number of programs in HD format. Modern TV sets can offer a range of great features like 4K HD resolution, vibrant colours and superb contrast. However, your state of art television set is of no use if you are getting a lousy TV reception. Setting up a TV antenna seems simple – all you need is a ladder, a string of cable and an aerial. Sounds pretty easy, providing you don’t have a fear of heights! In reality, even buying the right antenna that will last and give you a strong signal is not that simple. There are plenty to choose from, but which one is reliable and suitable for your location? We have tried a number of different brands and designs over the years and chosen a quality range for our digital antenna installations. Apart from having a good TV aerial you will also need to know what part of the roof to install it on and what direction it will need to face. We have a number of transmitting towers in Sydney, but which one should you be getting a signal from? 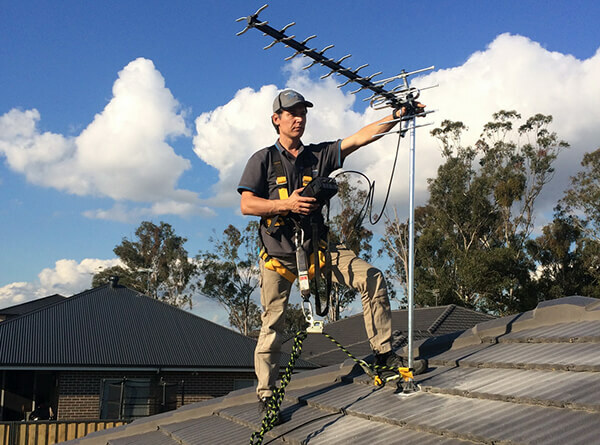 Sydney Antenna technicians not only know that, but also ensure your aerial is installed at the correct angle for a maximum signal strength. The other thing you really need to get right is the antenna bracket. It needs to be strong enough to withstand Australian winds, protected from rust and fitted with the proper mount suitable for your roof type. Our technicians have a range of brackets for any type of antenna installation and provide the highest level of workmanship during the set up. You can rest assured that you will be left with a neat job and the clearest picture possible on your screen!